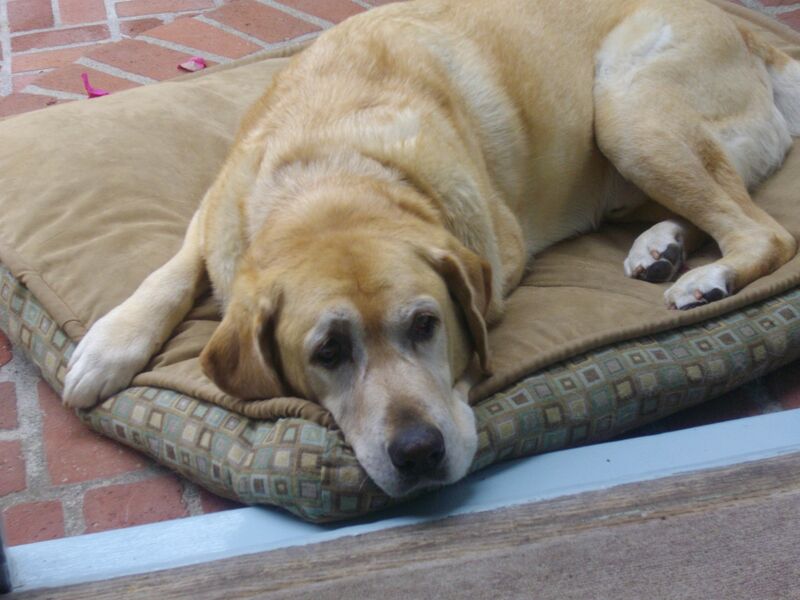 AUGUST 7, 2014: I’m missing Angus a lot lately. We’re on vacation at the beach in a little cottage where Angus slept on the front porch with his head sticking in the doorway into the living room. Every morning at this cottage for nine years I took Angus for a walk up the hill. In the evenings, the family took him for his nightly swim in the ocean. He’d jump through the waves chasing a tennis ball. Everywhere I look, I miss him. 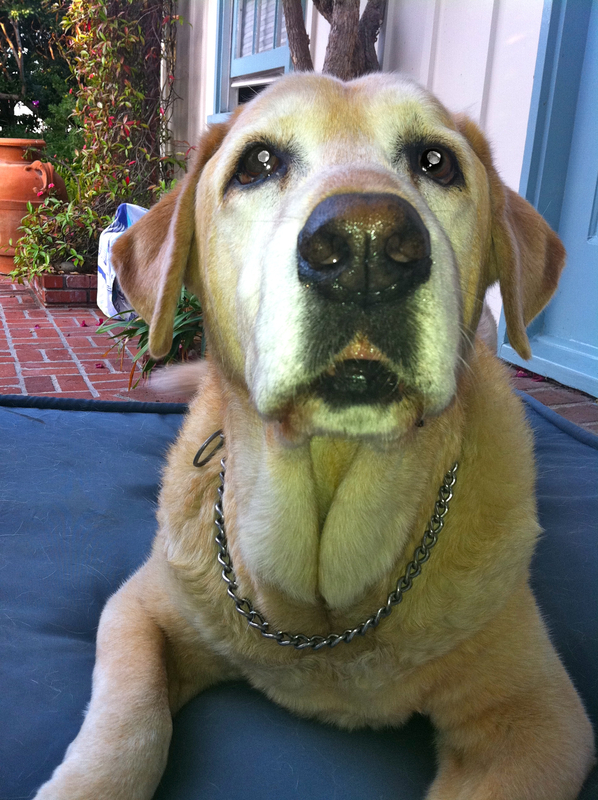 So, I’m reposting this story I wrote in honor of my son and Angus’s birthday last March. MARCH 14, 2014: Next week my son turns 21 years old. Officially an adult. 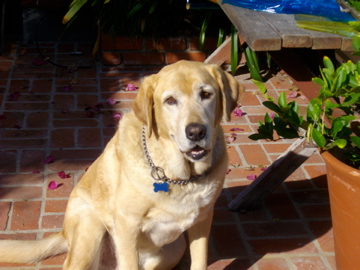 He shared his birth date with Angus, our yellow lab. But, sadly, this year Angus isn’t with us. He made it from my son’s 1st grade birthday to his sophomore year in college. 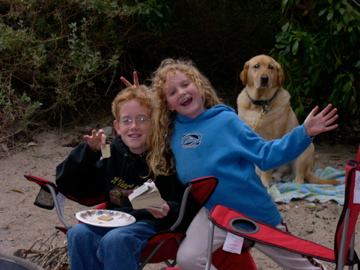 My kids with Angus at the beach. The following is a story I wrote when Robert invited 50 kids to his second grade birthday party. It was published in the Los Angeles Times Kids’ Reading Room. Camping with Angus in Carpinteria. I sat in the back seat while Mom drove home after school. My eighth birthday was in two weeks. “I can’t afford to take 50 kids skating or bowling. And I don’t want 50 kids in my house. What about the city pool? It’s heated, open year-round, and it’s only 50¢ a kid,” Mom said. “A swim party, that’s cool!” I said. “What’s decadent?” I asked. Mom used words I didn’t know. 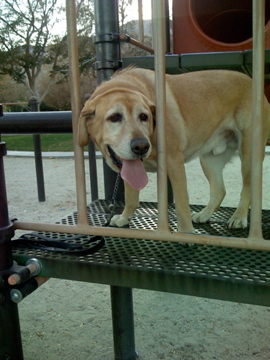 Angus watching the kids on the playground at Ruth Hardy Park. I sat silently and thought I’d be sad with no presents. Then I remembered Angus. Mom got him for me as an early birthday present. 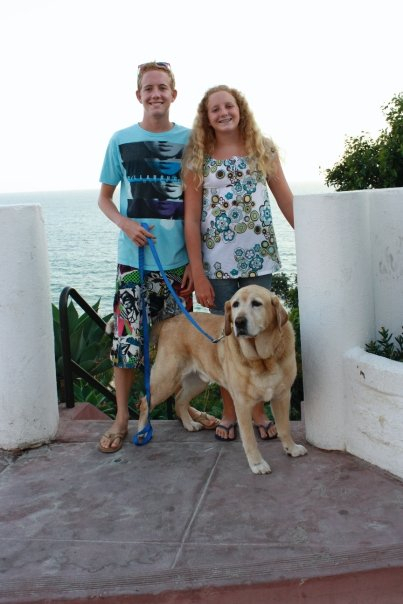 We were on a waiting list for two years with Guide Dogs of the Desert. He was being trained as a companion dog for people who couldn’t see. We got him because he had poor hips and couldn’t be a working dog. Angus was big, yellow, and I loved him. We shared the same birthday. Angus at his front porch post at the beach cottage. “What?” Mom asked, glancing at me in her rearview mirror. “Ah?” Mom made a weird swallowing noise. In the rearview mirror I watched Mom dab at the corner of her eyes with a tissue, and nod her head in agreement. Two weeks later, I had a great birthday. Fifty kids came with bathing suits, towels and money. Instead of opening presents after cake, we counted dollars they had stuffed into a large jar decorated with photos of Angus. Together, we raised more than $1,600 for Guide Dogs. Mom called me a “philanthropist” – whatever that is. 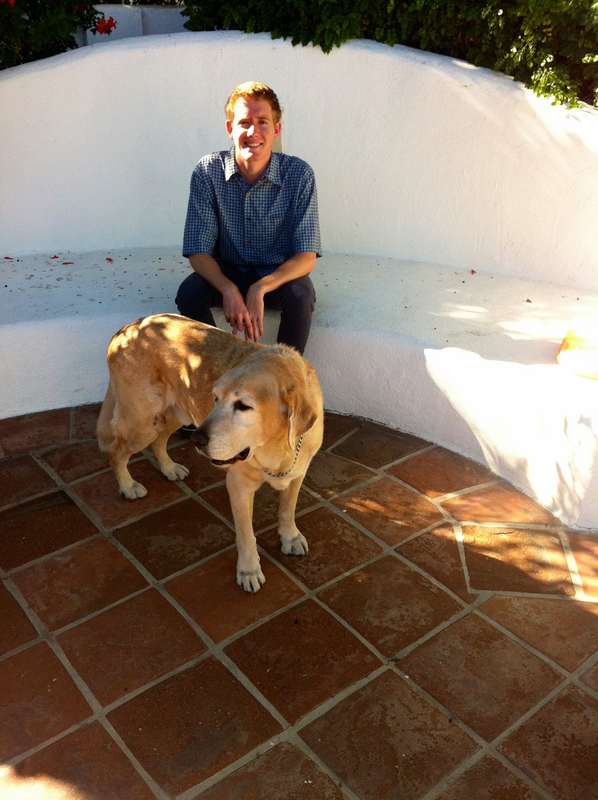 The birthday boys, Robert and his dog Angus. Here’s a link to a video of Angus doing his daily chore of getting the paper. This entry was posted in Allergies, Beach, Birthdays, Childhood, Dogs, Getting Older, Guide Dogs, hiking, Home, Kids, Labrador Retriever, Laguna Beach, Nostalgia, vacation, Walking and tagged beach cottage, Birthdays, Carpinteria, Dogs, Labs, Laguna Beach, Palm Springs, presents, puppies, retrievers, Ruth Hardy Park by bleuwater. Bookmark the permalink.